Simply hold the Hand-L in the palm of your hand and rest your straight thumb on the Hand-L (as in the photo); avoid hyper-extending your thumb. Treat trigger points as usual, except push/lean through your hand, not your thumb, allowing the Hand-L to do the work as you relieve the stress on your joints. There are several other ways to hold the Hand-L. See some examples in the videos and then let your creativity, skill, and client needs guide you. The unique shape of the Hand-L 2.0 utilizes leverage instead of strength making your work much easier. By holding the Hand-L as shown below, you can easily apply cross-fiber strokes, deep stripping or deep pressure. 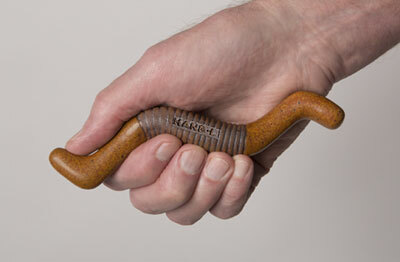 The Hand-L 2.0 makes a fabulous self-massage tool. It is especially good for working along the occipital ridge, the forearms, the hands, and the feet. Each Hand-L is made of high-fire stoneware clay. It’s extremely durable, hygienic and temperature sensitive. 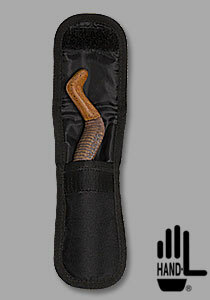 The Hand-L will break if dropped, so be sure to place it in the padded holster when it’s not in your hand. Avoid placing it on the massage table where the client may accidentally bump it to the floor. The Hand-L 2.0 is sold with a one-year replacement warranty if it breaks for any reason (even being dropped on the floor, because accidents happen). The Hand-L may be heated using hot (not boiling) water, a heating pad, sunshine, or by holding in your hands for a few minutes. It may also be chilled to provide cryotherapy applications. To clean, simply wipe with alcohol, or wash with soap and water. The Hand-L may be used with any massage lubricant: oil, lotion, salve, ultrasound gel, etc.